Leg 4 of the 2017 Maruti Suzuki Desert Storm concluded yesterday at Jaisalmer, with participants completing a total distance of around 300km. 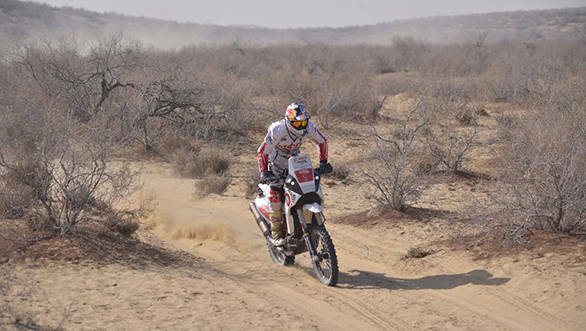 In the Moto category, Hero MotoSports Team Rally's CS Santosh managed to extend his lead by around 10 minutes ahead of TVS Racing's R Nataraj, with a total time of 7hr 20m 57s. Abdul Wahid Tanveer, also from TVS racing, is around 16 minutes behind Nataraj in third. Team Maruti Suzuki's Suresh Rana and Ashwin Naik continue to hold their lead in the Xtreme category with a total time of 9hr 21m 41s. Almost 12 minutes behind him are Niju Padia and Nirav Mehta, while Sandeep Sharma and Karan Arya are third with a time of 9hr 46m 56s. In the TSD rally, Nikunj Toshniwal and Suvrajit Dutta lead the Ndure category with a total penalty of 34m 16s, while Arpit Gupta and T Nagarajan are second with 44m02s. Suresh Kumar Dudi and Rajith Purusuthman are third with a penalty of 2hr06m08s. Leading the Xplore category are Karthick Maruthi and Sankar Anand, with a penalty of just 31s, while Rajesh Chalana and Satish Gopalkrishnan are around two minutes behind them. The fifth and final leg of the 2017 Maruti Suzuki Desert takes competitors around 500km towards Jodhpur for the finish.